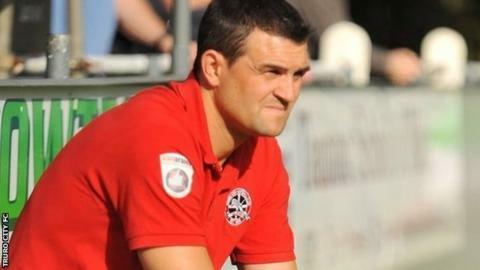 Truro City manager Steve Tully admitted his team were "below par" despite their 1-0 National League South victory at home to Chelmsford. Substitute Craig Duff scored to make it 10 games unbeaten for the Cornish side, who had Aaron Bentley sent off. "We didn't play very well but sometimes you have to do the rough stuff," Tully told BBC Radio Cornwall. "Sometimes you have to grind out a result when you sometimes don't deserve it. This was one of those days." The White Tigers remain fifth and in the final play-off spot, three points ahead of nearest rivals Dartford. Truro were already 1-0 up when Bentley was shown a second yellow card for kicking the ball away. "He hasn't lashed it right the way down the end of the ground, he's just passed it out of play, which is only five yards from the touchline - I thought it was really soft," added Tully. "It was a tough afternoon for us and there were a lot of performances that were below par, but we did enough in the end. "I'm delighted for Craig Duff - he really trained well this week and deserved his spot on the bench and I'm delighted that he came on and scored the goal."